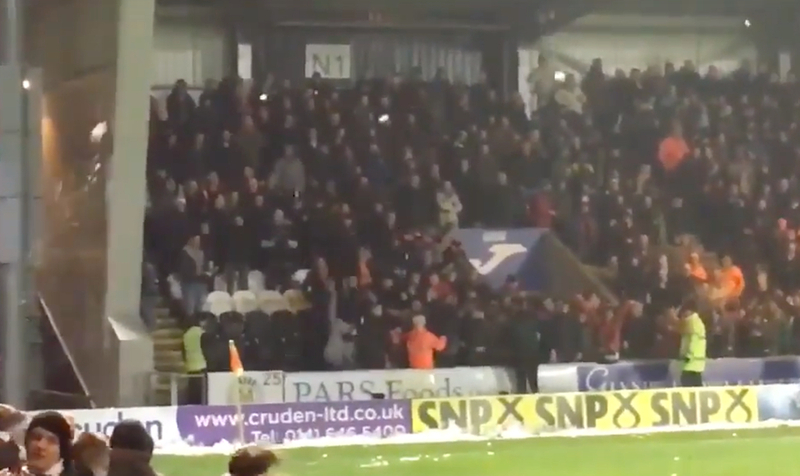 WATCH: Snowball fight breaks out in St Mirren v Dundee Utd! It's been a weekend of horrendous weather conditions across the UK in the build up to the festive period. It's been a nightmare for everyone whether you've been Christmas shopping or trying to follow your football team, with games around Great Britain falling victim to the adverse weather conditions. The weather has been pretty horrendous and it got us thinking to this time last year, St Mirren and Dundee United faced each other in a Ladbrokes Championship game at St Mirren Park. St Mirren rolled out 2-0 winners on their way to winning promotion but the main talking point from the game came when both sets of supporters decided to get involved in a hilarious snowball fight! It's something that you don't see too often and it resulted in a lot of laughs! The commentary box was just to the left of the fans and the pundits would've been thankful for the protection that it provided while the fans went for each other!